An online checklist at AutismSpeaks.org is also available for parents of toddlers. Often autism can be best diagnosed through centers at universities and children’s hospitals with the latest treatments and services. Keep in mind, autism includes a very wide spectrum of cases that range from mildly disabling to debilitating. Diagnostic criteria have changed over the years, and the milder Asperger’s Disorder was removed from the psychiatric manual in 2013. As a result of the broader diagnosis of autism spectrum disorder, there have been major drops in new cases of autism, Asperger’s and pervasive development disorder that potentially neglect vulnerable kids. This change will undoubtedly complicate research efforts and points to the need for quantifiable body “biomarkers” to establish consistency in diagnosis. Until we have this concrete analysis of brain chemistry and genetics, identification and removal of toxins in food and environment may help support the physical and mental health of the child. According to current physician opinion in Europe, ADHD has not been well controlled, even with medication. Unfortunately, research suggests that ADHD persists beyond childhood in at least 66% of cases. As some studies showed associations between ADHD and blood levels of iron, zinc, lead, and other trace minerals, more research is necessary to help determine how metal imbalance may contribute to some or all cases. As research moves beyond behavioral therapy into physical and chemical factors, the immune system has emerged as a driving force behind brain response. ADHD is associated with certain autoimmune conditions such as ankylosing spondylitis, ulcerative colitis, and autoimmune thyroid disease. Autism is also associated with autoimmune-related conditions such as irritable bowel disorder, epilepsy, and type 1 diabetes. Furthermore, autoimmune conditions have been associated with mood disorders and disturbed behavior for quite some time – as demonstrated in Alzheimer’s disease, schizophrenia, and psychosis, to name a few. The interdisciplinary field of psychoneuroimmunology has evolved to include some of this research, but studies in immunology have been hindered by this interdisciplinary nature. Children with autism often have a more permeable intestine or leaky gut, allowing the passage of undigested food particles and formation of food allergens and intolerances. While the more common IgE allergy tests (such as peanut and mold) have not linked food allergies to autism, there are other types of allergic/immune responses in the body that can lead to physical and psychological symptoms. One study pointed out that a high number of children with autism possessed autoantibodies to folate receptors. Parental reports show that dietary intervention was successful in improving autistic symptoms despite scientific difficulty in associating allergy with autism. Careful journaling may be required to track reactions and identify sensitivities. Artificial food colorings and flavors are particularly common triggers for ADHD symptoms, though sensitivities to other foods and benzoate is common as well. Good nutrition that reduces allergy exposure and reduces intestinal permeability can ease the toxic burden on the body and holistically support the brain and immune system. Intestinal permeability has been associated with a wide range of chronic disorders such as autism, Crohn’s disease, diabetes, asthma, celiac disease, depression, pancreatitis, and liver disease. Many factors in diet and lifestyle contribute to problems with intestinal permability including medications (including aspirin and NSAIDs), alcohol, H. pylori bacteria, Candida albicans, stress, advanced glycation end products (via grilling, broiling, or frying at high temperatures), and high-intensity exercise. Exposure to these factors may lead to the unwanted absorption of pathogens, potential allergens, and toxins in the gut. A detailed report on nutritional support for intestinal permeability can be found here at HealthyPixels.com. Sleep problems are common in children with autism and ADHD. In ADHD, problems include falling asleep, daytime tiredness, and night wakings. Surprisingly, some research even suggested that poor sleep patterns may predict ADHD symptoms. Autism cases shared similar difficulties with sleep onset and sleep duration. Sleep diaries and smart phone apps can help illuminate a sleep problem, while safe melatonin supplements can help improve sleep duration and onset. Melatonin supplementation actually improved height and weight growth of ADHD children on Ritalin. Interestingly, sleep deprivation may actually serve some purpose; animal studies revealed that the antioxidant system is triggered by sleep deprivation. This insight underscores the importance of reducing the oxidative burdens to reduce or eliminate a possible “compensation effect” that may be at play with sleep disorders. The most common approach to autism is early intervention through various behavioral therapies suited to the unique symptoms of the child. Early behavioral and developmental intervention has been helpful for many cases, but improvements are generally limited to less severe, younger cases. Popular treatments are listed at AutismSpeaks.org, including the common pivotal response therapy that uses unique, child-driven motivations to encourage language and social behavior. Sensory enrichment therapy has shown promising results, and a home-based, online service called Mendability is available for treating children as well as adults with autism, Aspergers, PDD, ADHD, and even dyslexia. While these innovative therapies have not provided a cure, they have helped children and families function and manage conditions with variable success. Behavioral therapy treatment for ADHD is not considered as effective, explaining the widespread use of medication for this condition. 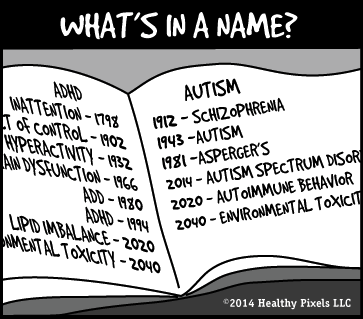 An estimated 2.7 million children were taking ADHD medication in 2007. Furthermore, boys with ADHD on medication were less likely to be obese. However, long-term safety and dosage guidelines are unclear, and long-term treatment appears linked to slowed growth in puberty. Interestingly, a Canadian study could not find any evidence of improvement with the increased use of ADHD medication in Quebec. Fortunately, the relationship between nutrition and behavior is slowly emerging. Low omega-3 levels have been linked to ADHD and are associated with anxiety later in life. Mineral deficiencies have been associated with depression, poor cognitive, social and motor function, and anxiety. The womb continues to appear more central to these imbalances, with nutrition affecting DNA methylation in the adult tissue of offspring. As health professionals begin to create individualized treatments for children and adults, we must consider these deeper layers of physical imbalance to improve long-term outcomes as quickly as possible. Part 4 of this series will post next week and discuss directions in nutritional treatment as supported by new research.